There is no perfect way to pack for any trip, regardless the scale. 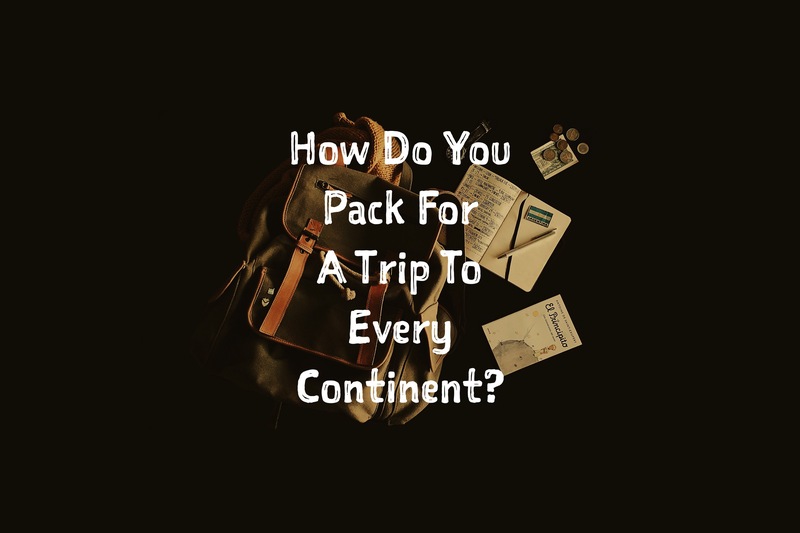 But after a few years of travels and lots of packing, I’ve come up with an ideal guide to help decide how one should pack in the most practical way possible. This is how I’m packing for my upcoming trip. Where Are You Going? Attempting to reach all seven continents and a multitude of countries, from the pureness of Michigan, to the islands of Fiji, to the heat of Africa, to the icy Antarctic, and beyond! When Are You Going? Now until whenever. I know it will be winter in New Zealand when I get there. As for when I arrive everywhere else…your guess is as good as mine at this point. What Will You Be Doing? A little bit of everything! Adventuring, exploring, teaching, and challenging myself in all sorts of countries spread across the world. How Long Are You Going For? Not sure. Two years is what I’ve been telling everyone. Could be more, could be less. It all depends. I want to pack light but how can I do so with such a sizeable, yet mysterious trip that could take me literally anywhere on Earth? The answer is simple. Pack the absolute essentials (listed below) and know that anything hefty (sleeping bags, winter coats, boots, etc) can be bought, borrowed, or rented later for whenever you may need them down the road. Throughout all of my previous travels, I’ve never had an issue. I’m not packing for major hikes and camping because I know there are rental companies just about everywhere for that. I’m not hauling around snow gear for Antarctica because I know there are rental areas for that too. There was a case where I needed a sleeping bag for a volcanic hike and a friend I met was able to lend me one which saved me money. Toiletries – a toothbrush, toothpaste, deodorant, razor, 2-in-1 hair and body soap. Ya know, the basics. Shoes – always have your one main pair of shoes that you will wear the most, which will most likely be your runners, trainers, gym shoes, casual, or whatever suits your style. After writing this list, I just realized how it’s catered more to males than females. Women tend to over pack more than men and I’m not sure what to tell you to bring. Think of what you use the most in your daily routine and go with your gut! Most travelers I meet abroad always say they over packed and brought too much. MacBook Air (Equipped with a protective case, screen protector, and keyboard cover) – lightweight, reliable, and easier to type on than my iPad which is currently retired. Seagate 2 TB Portable Hard Drive – one of my most important electronics. Mainly used to back up all the photos and videos I will take. I’m also storing a few movies and games to entertain me on my downtime. It’s extremely small, compact, and lightweight. Canon EOS 6D (Equipped with rubber body cover and screen protectors) – My newest big boy camera. This will be my companion throughout this upcoming trip around the world. GoPro Hero 4 Black – This is a must for any thrill seeking traveler. I took awhile to decide between the silver (which has a touch screen) or the black edition (which doesn’t have a touch screen, but records more fps). I ultimately decided to go with the Black. The touch screen will be useless when the waterproof case is attached and I can use my iPhone as a view screen instead if I really wanted to. I’m also bringing spare batteries and a lightweight extendable stick that can transform into a tripod. iPhone 6s Plus 128GB (Equipped with case and screen protector)– I’m bringing the big one because its great for pictures on the go and mainly because I know at some point I’ll be in South Africa and those kids in Stellenbosch would always play games on my iPad. I’m not bringing my iPad this time so this will have to do. I’ve already downloaded a bunch of old favorites on there including their ultimate favorite game “Subway Surfer.” I got the 128GB version because on my previous trip, I constantly ran out of room on the 16GB and always had to delete content. These are my most expensive and valuable items I’m bringing with me in order to share my experiences with the world. If I weren’t documenting or blogging, I would leave behind the MacBook, portable hard drive, and probably the GoPro. Every single electronic will be packed in my carry-on back pack with me through every airport. Never put your valuables in your stored luggage, should your bag goes missing. This will save you a world of headaches. 1. Water Shoes – I don’t use them often, but when I do, I’m glad to have them. For those situations when it’s best to be barefoot but not quite barefoot, these are a must for me. I used them while swimming through caves and river treks on recent trips and boy did they come in handy. 2. Travel Towel – I’ve never brought a towel with me on trips because they take up too much space and I can usually rent or buy a towel wherever I am. This time, I’m bringing this light weight, quick drying towel to help keep my bag as light as possible. 3. Waterproof Hiking Shoes – I don’t normally bring hiking shoes either as they are bulky and take up space but since I plan on doing some extensive hiking on this trip, a quality pair of hiking shoes will be essential. 4. Neck Pillow – Sleep comes a little easier with this. It came in handy when I was stuck in a bus station for two days and when I needed that extra support for when I stay in a place with just one measly pillow. Perfect to lean on when I’m in a window seat on a plane or bus. And small enough to store and take with me almost anywhere. I usually keep it attached the outside of my carry-on. 5. Waterproof Phone Pouch – There were times when I simply just didn’t feel like busting out my GoPro every single time I was in a situation that required me to get wet. That’s when my waterproof pouch came in as a great substitute. My phone fits right inside it and I can wear it around my neck. I can touch the screen through the transparent cover with ease and the photos and videos come out just as they would without the pouch. The pouch also floats in case I did lose hold of it. I actually used this more than my GoPro on a previous trip though Central America. 6. Motion Sick Tablets – I can’t travel without them. I will be on many different modes of transportation and will be loading up on non drowsy tablets. Whenever I ran low, I found that many countries sold their own versions. I have been able to find motion sick tablets almost everywhere I went, even some for way cheaper you would find in the US that worked just as well. 7. Travel Insurance – Don’t leave home without it. You never know what may happen. I can usually find good rates through my most frequent provider World Nomads. I keep a copy of my insurance in my document folder and a digital copy in my email. 9. Spare Debit Cards – Before every trip, I always ask my bank to send me an extra debit card attached to my account. I keep it separate from my active card (my active card in my wallet and my inactive card hidden somewhere among my bags). I keep the spare card inactivated and bring it with me just in case my activated one becomes lost or stolen. If such were to happen, I can easily activate my spare by inserting it into an ATM or calling the number provided which would in turn deactivate my old one immediately. Fortunately, I’ve never had a problem as of yet. Jeans – I’ve come to realize, I hate wearing jeans. They’re uncomfortable and relatively heavy compared to my other pants, yet I always brought a pair or two on my travels and barely wore them. Well not anymore! If there is an instance where I’ll need a “nice” pair of pants, I’ll just buy something wherever I am. Sleeping Bag – Just no. They’re too big and take up too much valuable space. Whenever I needed a sleeping bag, I was able to rent one for cheap or borrow one on the spot. I know I’ll need a sleeping bag eventually, but as for now I am okay. I’d say you should only bring a sleeping bag if your travels depend heavily on camping or sleeping outdoors. Money Belt – I’ve never actually used a money belt but the idea of it is beneficial and can help for a peace of mind. I personally am always conscious of my passport and wallet and secure them into my front pockets. If I’m walking through crowds, my hands are always in my pockets. I’ve been pretty good about safely securing my important belongings and the thought of constantly going through a money belt, snug tightly under my shirt every time I needed to get money would become annoying real fast. I can see it working for some but not a necessity for me. Fanny Pack (Bum Bag-UK) – No. I’m only bring a 75 liter backpack and a smaller carry-on bag for all of my electronics and a couple of articles of clothing to hold me over in case my luggage goes missing. My toothbrush, toothpaste, and deodorant is always with me on my carry-on. After a long flight, I go straight to the public restroom to brush my teeth and freshen up. With all of this, I don’t think I could ever pack perfectly for this trip. Anything can happen and I probably will end up in places I’ve never heard of or presented with an opportunity I didn’t pack for. Situations like these have happened before and I was always able to manage. In tight times, there was always a local friend or fellow traveler who were able to help me out. Hope this guide helps with your global trips, whether they be a few days to a few years, around the block or across the oceans. Happy packing! Feel free to leave your questions or comments below or to my email, daniel@adventurborn.net.